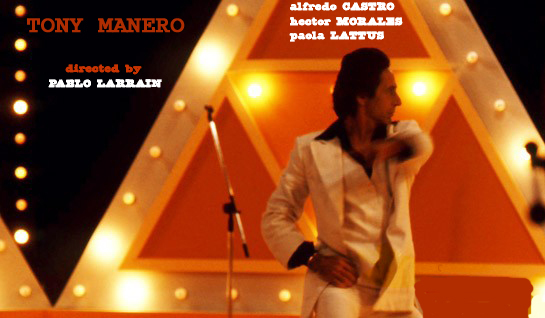 A film of Dardennian proportions, Pablo Larrain’s second full length feature Tony Manero is unlike his previous work on Fuga. Larrain collaborates with Alfredo Castro & Mateo Iribarren once again to bring one of Chile’s finest. Larrain uses the handheld style that has been catching on a lot recently in his latest film and because of it creates a gritty, real atmosphere that most of these films have. But, unlike most of these other features Tony Manero holds nothing back. With Pablo’s beautifully intimidating use of this new found style (he used traditional filming on Fuga) he divulges deeply into the grim realities – within the dark side – of humanity by simply shooting it as one would perceive it if it in fact happened in front of their very own eyes. With jarring camera movement during the horrifically violent scenes (basically shouting “you would look away, wouldn’t you?”) right down to the glamorous dancing competition, Larrain literally (mentally, not physically) throws you into the depths of late 70’s Chile culture. Alfredo Castro & Mateo Iribarren wrote Larrain’s only other feature Fuga, but unlike that film, this one is structured well and focuses more on real scripting rather than being very fantastical in plotting – they actually stick to something solid throughout the entirety; rather than throwing about a bunch of empty symbols with little actual dialogue/plot development. Since this is a film told from one character’s perspective – as well the fact that it’s basically a rule to have scenes where there’s no dialogue, but only movement in the Dardenne filming practice – there are somewhat lengthy bits of silence, but that only adds to the intrigue , thus adding to the grasp the film holds on you. Castro and Iribarren create a wonderful piece of cinema full of humorous irony, off-putting scenarios, and a disheartening ending. To those that enjoy such features as Rosetta, I would be pretty surprised if you didn’t enjoy this film as well. Since IMDb lacks a proper synopsis for the film, allow me to lay it out for you. The film is about Raul, (Alfredo Castro – yes, the co-writer of the film) a man who lives a typical life until he sees Saturday Night Fever and instantaneously becomes overly obsessed with it; so much, in fact, that he starts to dress up like Tony Manero, speak like Tony Manero, move like Tony Manero, and even builds his career around the life of Tony Manero – hence the title, eh? Well, he becomes more obsessed every time he sees the film… and he sees it everyday. He gets so mentally unstable that Tony Manero is at the pinnacle of holiness (for him) and murdering for any reason relating back to Saturday Night Fever is justified for that reason alone. And of course, he does murder in the name of Manero. The irony I was relating to earlier in my review is that of Chile’s diplomatic issues in 1978 (I saw this in another review, so don’t sue, but it was interesting and I thought it only logical to incorporate it somewhere here). Alright, so in late 70’s Chile, the Chilean government had diplomatic issues within itself – people would riot, go to length ends for what they wanted… you know, typical rioting stuff (note: this is also how Raul acts, so it could be a metaphor humanized!). Anyways, the Pinochet regime (Chile’s President at the time) is the issue Chilean’s had with the government (this is where they’d murder for no just cause, do horrible things… blah) and the ironic thing is that the Chilean president took most of his ideals from America (where Saturday Night Fever was made) – so basically, this is a simplified version of the Chilean issue and it resolves itself very nicely by the conclusion of the film; starkly, as well as perturbed. So like every handheld-shot film, Tony Manero contains very real, very excellent performances in its time on screen. Though we only have one true lead and a few other roles that are much smaller, every performance is great. Personally, I loved Alfredo Castro as Raul. He made such a sleezy, horrid character one that I was rooting for the whole way through. I haven’t a clue why: he embodies everything wrong in the world, but he’s such a desperate & lonely character, you can’t help but sympathize for him – Castro helps you feel for him with his joylessly expressive face. The final facial expression on Raul’s face was just a picture that could actually invoke 1,000 words to describe it. Great support comes from the rest of the cast – especially the dance group Raul works with vigorously, but more specifically Hector Morales who plays Goyo, his arch rival! Goyo is the pretty boy of the group and much more physically tuned up, which presents Raul a difficult challenge to be the best in the group, let alone all of Chile. Castro’s rigid and cold chemistry with Morales is some of the best of the year – see it if you love real emotions on film.